We’ve almost made it, Spring is around the corner! One of my favorite ways to prepare for the turn of the season is to window shop and gather outfit inspiration. 2019 is full of some amazing trends that I can’t wait to try out, so here are just a few of my favorites! The runways have been full of bright vibrant colors and I can’t wait to incorporate some into my wardrobe. From hot pink to emerald green and sunny yellow hues, the pops of color are sure to impress this season! I love the femininity of bows and how they can turn basics into an upscale, sophisticated look. Whether it’s adding a bow to a ponytail or a beautiful bow detail on a sun dress, I’m super excited to play around with this trend. 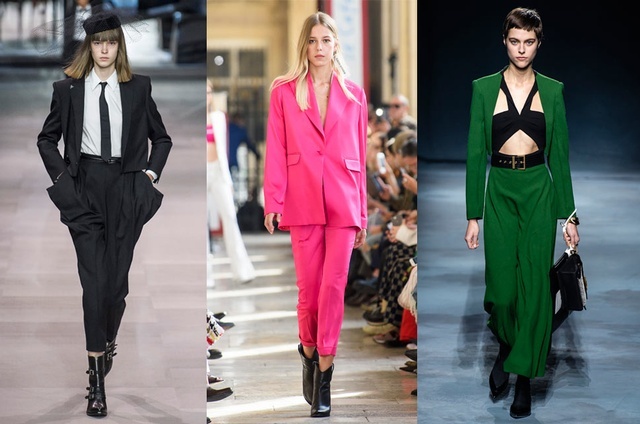 Over the past few years, suits have really taken off in womenswear and this year is no different. I absolutely adore the beautiful tailoring and smart look of a good suit. Maybe I’ll try pairing a bow in my hair with a structured blazer to contrast the masculine silhouette with the femininity of a bow! Ruffles are another trend that I’m really excited about. They can be tough to pull off, since they add so much volume, but adding a couple ruffles to my wardrobe sounds like a fun challenge! I especially love the look of a ruffled sleeve or skirt hemline. I’m absolutely obsessed with some of the gorgeous strap details I’ve seen on the runways this year. The jeweled straps add a layer of glitz to a basic tank top and are reminiscent of a beautiful piece of lingerie. I can’t wait to add this trend to my wardrobe.